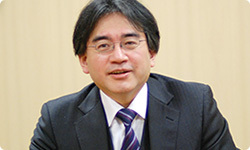 Editor's note: this is a translation of an Iwata Asks interview that was originally published in Japanese on the 10th of March 2011. Today I'd like to talk about the software that is pre-installed on the Nintendo 3DS system. Thanks for coming by today. First, I'd like each of you to introduce yourself and tell us what you have been involved with. Let's start with you, Kuroume-san. Sure. I'm Kuroume, from the UI Design Group of the Software Development & Design Department. Up until now, I've worked on the development of built-in features on each type of hardware. The first thing I handled was the menu screen on the Nintendo GameCube system. In other words, you've been doing this job ever since creating software for built-in features became the norm. Yes, that's right. This time, the other team members worked hard and did the actual development of built-in features for the Nintendo 3DS system, so I handled peripheral adjustments at the development site, and was in charge of providing support. 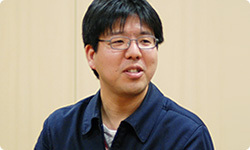 I'm Takahashi from the UI Design Group of the Software Development & Design Department. On the Wii console, I was in charge of pre-installed software such as the Mii Channel1 and the Everybody Votes Channel2. This time, I worked with everyone here to come up with the specifications for built-in features. I also directed the HOME Menu, the very first screen that displays when the Nintendo 3DS system is initialised. 1 Mii Channel: One of the Wii Channels applications. You can use simple operations to put together facial features from your family and friends and make an avatar called a Mii character. 2 Everybody Votes Channel: One of the Wii Channels applications. It can be downloaded (free of charge) from the Wii Shop Channel. You can vote on surveys sent to you and enjoy viewing the results. I'm Akifusa. 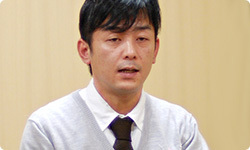 Like Takahashi-san, I'm from the UI Design Group. On this project, I directed Nintendo 3DS Camera, which can take 3D photos, and Nintendo 3DS Sound, where you can listen to music or record sounds. So you were in charge of the camera and sound software. Yes. Last time, I worked on Nintendo DSi Sound3, and this time, because of that experience, I was involved with two sets of software. 3 Nintendo DSi Sound: One of the pre-installed applications on the Nintendo DSi system. Besides listening to music saved on the SD Card, you can play around with the songs and record sounds. 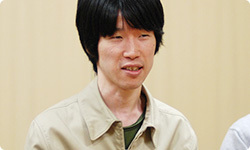 I'm Kawamoto, from the Software Development Group of the Software Development & Design Department. On this project, I directed StreetPass Mii Plaza, where lots of Mii characters gather, and the AR Games that use the accompanying AR Cards. I also kept an eye, indirectly, on Mii Maker, where you can make Mii characters of a variety of different people. 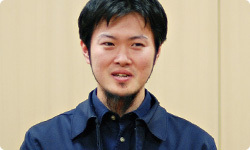 I'm Suzuki, also from the Software Development Group of the Software Development & Design Department. I directed Face Raiders, where you and your friends can play with your faces. 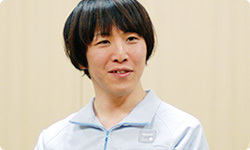 I'm Mizuki, from the Network Software Development Group of the Network Business Department. For the most part, the built-in features of the Nintendo 3DS system were developed through cooperation between the Software Development & Design Department and the Network Business Department, and I acted as coordinator on the side of the Network Business Department. All right. Let's start from the beginning: when developing pre-installed features for the Nintendo 3DS system, what sort of things did you discuss first? Takahashi-san, can you explain? Of course. First of all, around June of 2009, there was an assembly called the Pre-installed Features Section Meeting. 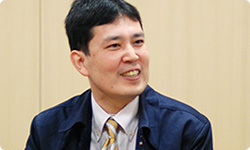 Akifusa-san and I acted as chairmen, and we held discussions about what the built-in features of the Nintendo 3DS system would be, and what kind of applications and built-in software should be on it. That said, out of all the built-in features for the Nintendo 3DS system, Mii characters played a very important role. 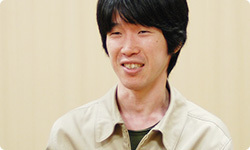 Since you created Tomodachi Collection, Takahashi-san, it seems incredibly natural to me that we had you sign on. All right, what sort of things did the Pre-installed Features Section Meeting talk about? Whenever people see something fun, they very much want to show it to their friends and family. So we decided to incorporate that sort of element into the built-in features for the Nintendo 3DS system. However, we got a lot of suggestions, and they just kept coming, and it turned into something enormous. It suddenly just ballooned on you. Were you saying, "Somebody had better wrap this up soon or it's going to go critical on us!"? Yes. It almost got to that point. (laughs) So we narrowed it down to a select few things. How did you go about settling on and moving forward with the HOME Menu, the one you directed? On the Pre-Installed Features Section Meeting, Kuroume-san was the director for the menu, and we discussed what sort of menu it should be with everyone here. We thought, while we wanted to keep the operability of the Nintendo DSi system, we also wanted to do something a bit interesting. First of all, we talked about how we could display more icons at once than we could on the Nintendo DSi system. On the Nintendo DSi system, you could display five icons at once, correct? That's right. But this time you can expand or shrink the icons, so Kuroume-san said, “In that case, it would be fun to be able to display a lot of them at once, maybe fifty or so.” When we tried making a prototype, it turned out we could display sixty icons at the same time. But, even though they were so tiny, you could tell which icon belonged to which software. We got part of the idea for that from the Photo Channel of the Wii console5, too. 5 Photo Channel: One of the Wii Channels applications. A channel that displays photos and videos - that you've shot with your digital camera or mobile phone - on your TV and lets you play with the photos. Oh, I see. It does feel a bit like the Photo Channel that you were in charge of, Kawamoto-san. They line up in different orders automatically, and you can change the size as well. The motion feels quite similar, too. We took quite a lot of cues from the Photo Channel. Then, in a separate frame from those normal icons, up above, we lined up Notifications, friend list and Game Notes. You wanted to be able to call those up any time, you mean. That's right. For example, even when you're playing another game, you can temporarily call up the HOME Menu, touch Game Notes, and make notes about the game. If you touch ‘friend list’, you can read comments from your friends, and if they're connected to the Internet, you'll be able to tell what they're playing. By the way, I got the feeling that the fact that Mii characters would play an important part was discussed from quite an early stage. Was that the case? So it isn't necessary to register friends for each game, the way it was with the Nintendo DS and Nintendo DSi systems. That's right. You can play against each other via wireless communication and use the wireless communication mode without re-registering them. The concept for this friends list had been brewing at Nintendo since long before I joined the project for Nintendo 3DS. Yes. (laughs) You can register up to 100 friends in Tomodachi Collection, and you can register up to 100 friends on this friend list, too. Not only that, these friends really are your friends, so I think it will become a real Tomodachi Collection.